In Venice it is always exciting to get off the public boat at the Salute stop. The great church of Santa Maria della Salute stands proudly before those who alight here. No artist worth his salt visits Venice without painting at least one canvas of Longhena’s masterpiece. Its bravura is astonishing. And a few pleasant steps away stands the Centurion Palace, an hotel which occupies one of the grandest-looking Gothic palazzi on the Grand Canal. It has been wonderfully restored. Its painstaking restoration took many years and has resulted in an establishment which is now regarded as one of the finest in the city. That reputation is being enhanced by its dining room, Antinoo’s. The restaurant is on the ground floor and occupies two rooms. One is white and one is red. Each conveys an aura of stylish modernity within an ancient setting. I chose the red. I was shown to my table by the charming Assistant Restaurant Manager, Matteo Molinari. This fine fellow looked after me with the utmost courtesy and attention throughout the evening. Settled in a comfortable chair – padded with cushions for me (to accommodate my demanding back) – I could look straight across the glistening waters of the Grand Canal. Outside the darkness was intensifying: inside the lights caused the glassware by Bormioli and the porcelain by Schönwald to sparkle and gleam. Mr Molineri sorted out the canned music for me (so that it was jolly Classical) and brought me a glass of Franciacorta blanc de blancs. The napery was white and (as I like) the napkins of those who left the table for a moment were replaced. All was set fair for a really good dinner at Antinoo’s. But why the strange name? Who was this eponymous gentleman? Well, it seems that during the years of the palace’s renovation various artefacts were found in the building’s foundations. Among them was a Roman coin. And upon the coin was the name of a Roman centurion. He was Antinoo. Having, one supposes, served the Roman Empire with courage and loyalty, this long dead soldier now serves the Most Serene Republic of Venice by providing a name for one of its best dining rooms. 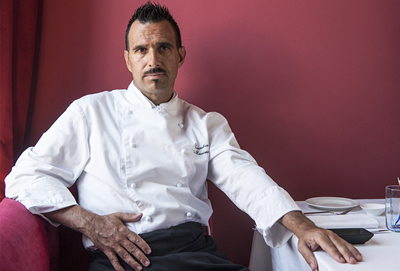 Chef Massimo Livan is clearly not afraid of hard work. The complex dishes which come from his kitchen certainly involve a great deal of preparation. He also cares about finding the very best ingredients. Presentation, too, is a strong point here, with the Chef ensuring that each of his plates is a pleasure to the eye as well as to the palate. The wine list is impressive, with several hundred offerings, and there is much to tempt the fan of Italy’s finest producers. Prices run from 33€ for a local white to 620€ for the 2004 Amarone by Quintarelli. These other bottles caught my eye: 2011 Ornellaia (497€), 2014 Sassicaia (447€), 2013 Solaia (530€), 2016 Planeta chardonnay (60€) and 2014 Gaja Barbaresco (465€). 16 examples of sparkling Franciacorta are available. They include my favourite, Anna-Maria Clemente from Cà del Bosco (360€ for its 2006 vintage rosé). Mr Molinari brought to me table a truly superb 2008 Amarone. These wines are famous for their density and weight, and this one certainly needed its decanting. But then it was a magnificent and complex beast – rich, smooth, soft, voluptuous, a gorgeous blend of black cherry, spice, tobacco and leather (Hatteso, Garbole – 190€). Such drinking always lifts my spirits. Antinoo’s is a fine restaurant. It provided me with a most enjoyable evening. Now I have even more reason to be excited when I get off the boat at the stop marked Salute. Centurion Palace Hotel, Dorsoduro 173, 30123 Venice, Italy.